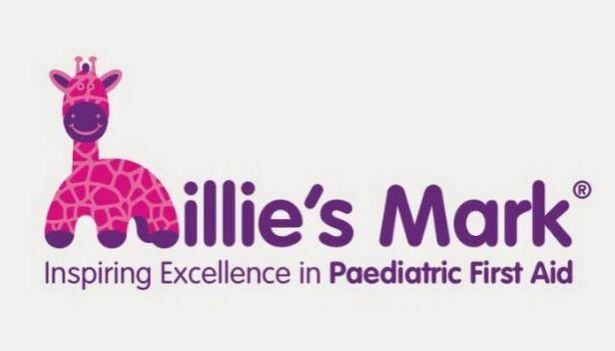 We’re the first nursery in Berkshire to have achieved Millie’s Mark! We have successfully been awarded ‘Millie’s Mark’, a Quality Mark for nurseries which demonstrates that the nursery goes above and beyond the minimum requirements in paediatric first aid. With its robust processes and documentation, the nursery practitioners strive to keep children safe by minimising risks and accidents and hopefully giving parents that greater reassurance. This has been awarded by National Day Nurseries Association (NDNA) in association with Department for Education and Millie’s Trust. Many of you will be aware that over the past six months we have been working hard to achieve this award, which acts as an indicator that we go above and beyond the minimum requirements to keep children safe and minimise risks and accidents. We are delighted that our efforts have been rewarded and that we have achieved this very special award. Although we are now an official Millie’s Mark awarded nursery, our hard work of continuously developing our quality care and education will not stop. It is crucial that we maintain the criteria over its three-year lifespan before re-assessment. We will be holding a celebratory party in September … date to follow shortly!